We design very high temperature steam machines to weed leaf and root systems using a specific water quality. Our solution is groundbreaking because it is currently the only one on the French market that can kill the roots of weeds. 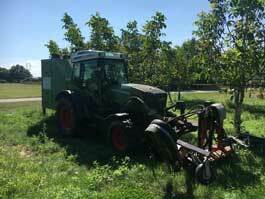 Towed by a tractor using the tractor’s 3-point hitch, this machine can be used in winegrowing and tree growing, all you need to do is change attachments. We can currently weed out brambles and bindweed and are conducting tests on Asian knotweed. It is also innovative because it requires very little water: 60 litres/hectare.